Smile a Day: Doggo's Joy on a walk. #smileaday My doggo's joy on a walk. The doggo and I went to Riverwalk today. It's our favorite walk when it's been raining because it's paved, but still feels like a wooded path. There are two paths you can walk: a loop that takes you alongside the river and towards a nearby park and a longer path that take you the other way alongside the river and eventually hooks up with other walking trails. Generally, we take the loop because it's short enough to do on a time crunch, but today, when we got to the "choose your direction" moment, he stopped and looked back at me and tugged towards the longer path. I looked at those puppy eyes and instantly caved. I said, "Okay, bud-bud, take me to the river." You never saw such a joyous dog! (no photographic evidence of joyous dog because a tail wagging that fast cannot be captured by a mere cellphone camera). #smile a day False spring. The dog and I made it out for a walk in daylight again today. That's getting easier to do, because daylight is lasting a bit longer. We saw daffodils today. I feel bad for the daffodils, because they're probably going to die quickly since they bloomed before it's really spring, but they also made me very happy with their burst of yellow in the winter-browned woods. #smileaday A new place to walk. A friend told us about a little used park in our own town. I didn't even know it was there! Though I can still hear the highway from within, it was lovely in that all I could see was trees for a long, deep view. The weather was perfect, and even my tween, who didn't really want to take a walk, found it enchanting when the sun hit the mossy part of the path and made it glow. We'll definitely have to go back in a greener season. This is O'Neill. 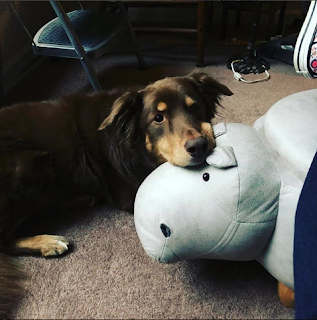 In the picture, he's watching me write, and sharing my hippo footstool. He's a great writing coach. He lets me tell him stories and listens very patiently, even when the stories don't quite make sense yet. He's a big-picture sort of guy that way. When I've been sitting here too long, he lets me know it's time to go for a walk or get a snack. If I seem agitated, he'll put a paw on my knee or nudge a nose under my elbow to remind that it's okay. I've always got him.